A new plaque has been unveiled in honour of Neale Cooper. And now, the family of the late Gothenburg Great, Neale Cooper, have donated money to help man’s best friend at an animal centre in the Granite City. Mrs Murray’s Home for Stray Cats and Dogs, which is based in Seaton, revealed the kind gesture last night, while highlighting a new plaque which has been created in the former player’s honour. 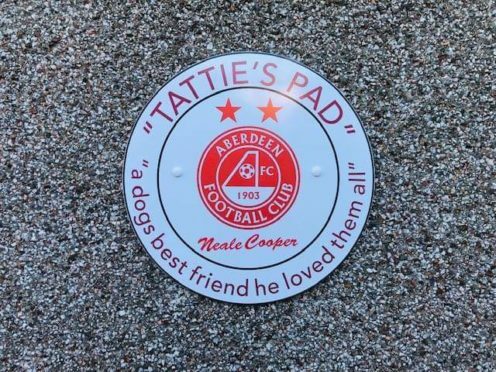 They confirmed that part of their facilities will now be called after Mr Cooper – known far and wide as “Tattie” – who died last year, aged just 54. An Aberdeen FC spokesman said the news confirmed how Cooper was still regarded with affection throughout the north east, both on and off the pitch. He added: “Neale’s love of dogs was well known and he would have been absolutely chuffed with part of Mrs Murray’s Home for Stray Cats and Dogs being named after him as a legacy to his fondness of our four-legged friends. Mr Cooper was part of the Aberdeen team which triumphed in the 1983 European Cup-Winners Cup, famously beating the mighty Real Madrid 2-1 in the final in Sweden. He retained an affinity with the Dons for the rest of his life and the supporters turned out in their thousands – along with the rest of the Gothenburg side and their manager, Sir Alex Ferguson – at his funeral, following Mr Cooper’s premature death last May.